The first Handheld port of Gran Turismo is a Gem for any racing fans. More than 800 Cars, 30+ tracks and a lot to do. The Graphics are superb, the sound too. 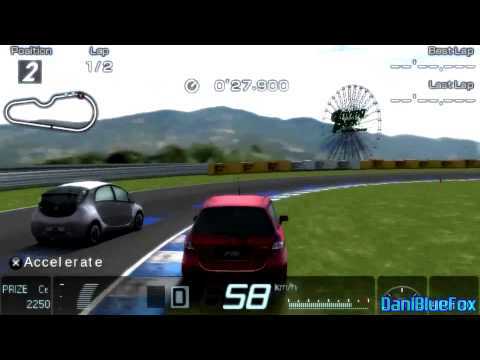 It is a combination of Gran Turismo 4 with some aspects of 5 and 6. The only missing thing is a story mode. You will not find any Championships or FR/MR/4WD specific races here. You can participate in races on all the original tracks, unlock more difficulties on each track and gain more Credits to purchase more cars. These can be collected, and there is more than enough for you there. There are also Driving Challenges, much like the driving licenses. These are completely optional, but will further your driving skill and will provide some credits too. All in all one of my favorites for the PSP, and a great game for a handheld. All Gran Turismo fans will enjoy this surely. Now you can add videos, screenshots, or other images (cover scans, disc scans, etc.) for Gran Turismo (Japan) to Emuparadise. Do it now!